I remember coding; I miss it. And I like clients. (Hi.) But I focus mainly on Beezwax’s internal dynamics as an organization — our teamwork, our ability to effectively create together, to enjoy our jobs together. I’m focused on the Human Resource. This has been immensely satisfying. I hear often, and agree: Beezwax is a place where we love to work. And I think this has been a good business strategy. Really smart people do really great work, which makes clients happy — and coming back for more. However, a lot of really smart people, I have found, don’t particularly want to have a boss, and yet want to work as part of a team — to enjoy intellectual community and the opportunity to complement their own skills with those of others. However, scaling Beezwax, while keeping the structure flat and collaborative, is a continual effort — the nature of it is precisely that: to try to stay continually attuned to the ever-evolving desires, needs, and potential of each member of the team. Teresa: Thanks for doing this, Julian. I gather this is the first published interview you’ve done. What’s the matter – you shy or something? Julian: Well — thank you. And no, not shy. But, yes, this is really the first time I have put forward something publicly that is an expression of my views on what I do for a living. For 18 [now 20] years, everything we have put forward has been created by someone else in the company — the tools, products, and solutions we’ve created…the technical capacities we have. We have not marketed anything about me or what I do. Being in the background has been intentional, and part of what is valued at Beezwax has happened in part because the company has not been focused on the “President and Founder”. In many other companies, the Founder’s client-facing expertise is a focal point of the company’s identity. I learned early on that there are people who are much better than me at custom application development — and that if I created an environment that was satisfying for them to work in, they would attract other talented people and put us on the map in our industry. That’s what’s happened. It is my colleagues who are the reason clients hire Beezwax, and my job remains focused on supporting my colleagues to have the best work environment possible. And this is a nice juncture for me to start sharing publicly how we built a company culture that people love. Teresa: So, if we’re talking now about your role…what skills have you been using to shape Beezwax culture? Julian: There’s one skill that I’ve been honing that I think is pretty cool. I actually am trying to think of a new word for it, so I’ll just describe it and maybe someone reading can think of the best word for this. The skill is used in conversation with one or a few individual staff members (we call ourselves “Beez”), and the skill is: summarizing very quickly what is happening in the company as a whole, in a way that gives those individuals immediate opportunity to help shape the company culture and direction. The first step is taking the time to do this — that’s a business choice. It’s gonna take some of my time and some of the other Beez’s time to have this conversation and the follow-on threads. So, there is cost in doing this. But, in the long run, it pays for itself. And so there’s this summarizing skill, which I’ve really been enjoying developing. 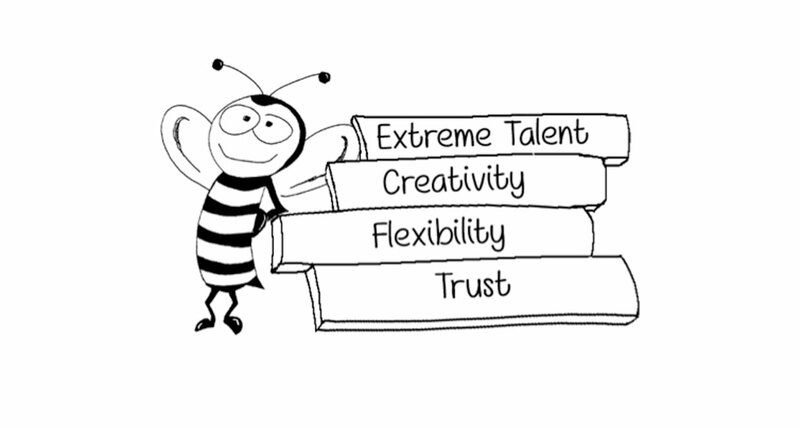 Such a fun challenge to think: “Ok, knowing (from my review of payroll time records and various communication threads) generally how this Bee is spending their day and what their skills and interests are… can I quickly identify aspects of the company that could benefit from this Bee’s contribution/perspective?” Sometimes this is simply connecting different Beez, who are dealing with similar challenges (perhaps in different contexts), and inviting them to problem-solve together. Or, I take business questions that I’m currently wondering about — how we should handle a difficult client situation, our choice of a new professional services vendor, the structure of our benefits program, tools or technologies we are looking into — and ask targeted input from the Bee I’m talking to. So, the skill is taking the larger picture and channeling it as pertains to this individual, and working with them to learn how they see that part, and incorporating their input into the whole. What do we call that? With now 47 Beez, we call that a busy day. [June 2016 update: now 59 Beez. Oy.]. But maybe there is a new term for this. I think of Robert Heinlein’s term “grok”, and I feel this is sort of connected. To understand the whole, and the role of the individual within that, and from an intuition level — not just charts and plans — but the essence of things that are happening in the company, and to distill this to something you can talk about productively in a few minutes. Teresa: I like how you’re actively thinking about and revealing how individuals can help forward Beezwax culture in a day-to-day context. You’re thinking about culture change in an immediate sense, conducting micro-experiments, and being transparent. It’s starting to make more sense to me that you studied Intellectual History with an emphasis on Utopian Speculation (visions of the “ideal” society). You told me before that from this education you came to believe that engaging work is a key element across all utopian visions. Describe your vision of the utopian workplace. Julian: The utopian workplace is seamless between work and the rest of the day. The effort you put into working at the job feels similar to the effort you put into being at home. Because it’s all very satisfying and engaging, like an extension of yourself. You don’t feel like you give up part yourself to go to work. There is no surrendering of self; it’s like stepping into what needs to happen and you want to make this step. You believe in the result of what is going to happen. Business mechanics that support this includes everyone being paid hourly and working the amount they choose. Many of the benefits — like PTO and Holiday Leave — are calculated pro-rata (based on percent worked). Also, everyone has at least one “internal” project, a contribution to the company that they can work on at any point to make it easier for them to balance their schedule. Fortunately, with so many developer-Beez, we are able to accommodate the desired schedule for each individual. We each decide for ourselves where we want to work; these days, Beez are working up and down California, as well as six other States and four other countries. The developers are encouraged to learn new technologies and choose the projects they work on. Flexibility supports that great utopian workplace goal — creativity. A flexible work environment puts emphasis on the inherent creative skill and savvy of every worker, not pre-defined routines. Creativity happens in open space. When you can be comfortable in not always knowing what’s going to happen next, you allow for brilliant breakthrough design and clever innovation. Creativity is confidently and resourcefully figuring it out in the moment. In order to foster flexibility, you need mutual trust within the Organization. I think it is the absence of trust that makes people’s jobs regimented. Over an 18-year [now 20-year] vetting process, we’ve hired trustworthy people. At our 2012 Holiday Party, a punchline of the toast I gave was that everyone on staff has job security. This was not a new status, but certainly was a statement that earned a few sips of champagne, and was an acknowledgment of a fundamental principal of the organization. We hire very carefully, and set thresholds by which a candidate needs to prove themselves in a variety of ways. From that point, and on-going and including right now, everyone on staff has the guarantee that we will provide work for them. Through two recessions we have never laid anyone off, nor ever failed to provide the amount of work we promised. Letting staff go has been rare and only for reasons of poor performance, and only after serious managerial efforts to improve that individual’s performance. For quite some time, no one on staff has needed to worry about this as even a possibility. This posse has been vetted; all have the core skill, competence, and reasonableness required to contribute to our Organization and client work. If a Bee makes a mistake, we deal with it as a firm. When the economy takes another downturn, we will deal with it as a team. This is also part of how we build trust. Meanwhile, because Beez can trust in their job, we can all be totally blunt with one another. Critique is always constructive. And, therefore, there is no reason for a staff member to hide — anything. We know fully and immediately when there is a problem — so we can begin addressing it immediately, and with clarity. There is no time for job-protecting B.S., and we’re all invested in one another’s success. And if you have this as the core of doing business, it matters a lot less whether the person is doing their job from their home, or one of our offices, or the client site…or the beach. Whenever I walk into the Beezwax office, I am greeted by a bunch of hardworking people on computers who are also warm and friendly. It’s a satisfying mixture that keeps me coming back. Nice work, Beezwax team.